The Grand Canyon, Petrified Forest, Monument Valley: When you think of Arizona, you think of the grand terrain. From high pine forest to the endemic Saguaro of the deserts in the south, Arizona varies tremendously in altitude, climate, and environment. Nearly 7 million people call Arizona home, putting it squarely between Washington and Massachusetts on the depth chart, and of those, 2/3s of them live in "The Valley"- better known as the Phoenix-Mesa-Glendale CSA. With all those people, you'd think there would be all sorts of weird rides and attractions, and you would be right. On the edge of the unknown, Arizona's lone permanent dark ride is one of the Kingdom Quest trackless units installed at the Tempe Legoland Discovery Zone, and of course there's the State Fair every year with some big steel brought in by Ray Cammack Shows and Bishop Amusement Rides. Big Surf is the point at which all discussion for Arizona amusement legend probably has to start. Back in 1969, Big Surf completed and opened one of the two claimed "first" wave pools in the world. You might recall that an entirely different group constructed one in Alabama from a previous edition of this very series. Well, this is the competitor. Unfortunately, most of the original concrete slides for the park have been replaced with more generic fiberglass tube slides, and they really aren't anything to get too excited over. This is probably a good point in the article to discuss some of the aspects that make the Phoenix market a little different than other major metropolitan areas in terms of the construction and operation of a permanent amusement facility. Temps in Arizona get hot - 120 Fahrenheit hot - and regardless of how dry it is or how used to these sorts of conditions you imagine one might get residing there, the simple reality is that it is too hot for any sort of serious outdoor activity (when one is not submersed in water). As such, that prime summer season for most everyone on earth is commercially non-viable in Arizona. It gets cool enough in winter to be a bit chilly too, which makes the whole place not ideal to run a big amusement park, even if you could, theoretically, operate all 12 months of the year. Water parks are a different situation. 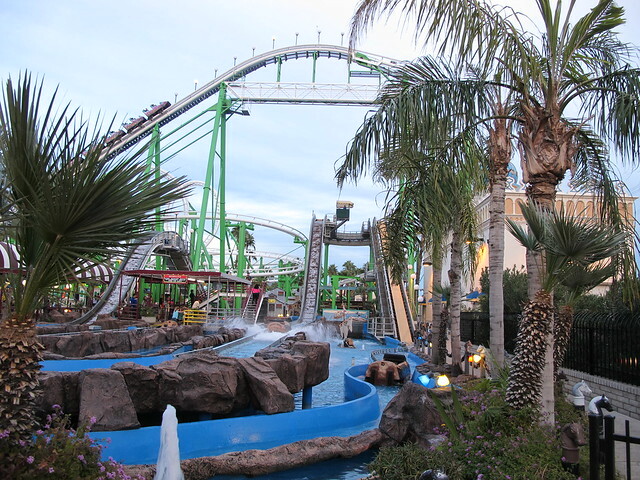 Big Surf has 2 significant competitors within the market; Wet N' Wild Phoenix has a number of modern slides, most from Whitewater West such a dueling water coaster, Constrictor, and a Boomerango. Over at Golfland Sunsplash, you have the Proslide variations on those attractions. Either way, you're basically seeing more advanced water park stuff than what is in Southern California or Orlando. Smaller water parks can be found in Tucson and Yuma too. Castles n' Coasters in Phoenix, AZ is the only real "dry rides" amusement park of note in the entire state. Akin in size and style to a facility like Orlando's Fun Spot or Ocean City, MD's Jolly Roger, there's a tight footprint with stacked attractions, a big arcade, and enormous mini golf. Being completely honest, for what this is, they put in a surprising amount of effort in the design of the buildings and signage. 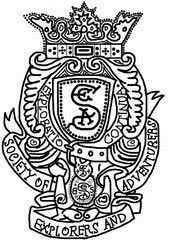 Locals often complain that it has a rough clientele, which may be code word for "Mexicans." If being around Hispanics is enough to cause you terror, why are you even reading this? Stick to someone's vlog where they review flax breakfast cereals. Interestingly, Castles n' Coasters offers a bit of an ironic twist when it comes to decor. Many of the buildings are clearly built with a Middle Eastern flair, approximating mosques more than anything. Yet the coaster names of "Desert Storm" and "The Patriot" hearken back to the first Gulf War of 1991 (they both opened in 1992). Both coasters and the log flume are products of O.D. Hopkins. Fun fact about Desert Storm in particular: Hopkins built 4 looping coasters over their history, and each of the four feature entirely different track designs. At the time of last/current operation, all four also had pronounced differences in rolling stock. Desert Storm is also perhaps the best operating thanks to the strange second inversion and lap bar restraints. Phoenix happens to be home to an assortment of generally strange, outlier stuff theme park wise. Wildlife World Zoo has a skyride, a new Chance family coaster, and a log flume which passes through an aquarium. There's an assortment of antique carousels in Gilbert, Chandler, Scottsdale, and Phoenix, as well as a more modern carved carousel at the Phoenix Zoo. And then there's Schnepf Farms. And really, there's not much stranger than Schnepf Farms. -Gravity Roller Coaster. Previously named the Peachtree Express, this is the only remaining Miler "World's Largest Portable Roller Coaster" model in the world. It looks like a very large version of the standard Miler oval model that was subsequently copied en masse. This is also one of the ten oldest steel coasters in the World. It was built in 1953, the same year as Hanayashiki Amusement Park's Roller Coaster (Japan's first coaster ride of any kind) and 6 years prior to the tubular steel Matterhorn coaster. -Gold King Mine and Ghost Town in Jerome is not only the most remote, but the least developed of the bunch. No real rides, but plenty of gritty, dusty, rusted realism along with a good dash of carny spirit. -Goldfield Ghost Town in Apache Junction, an hour east oh Phoenix on the edge of the Superstitions offers visitors the real and hyper real. Real excursions by 4X4 can be booked into the heart of the nearby Superstition Mountains State Park. For those seeking something a little less bumpy, there's a gravity house attraction (think real life "Gravity Falls"), narrow gauge railway, museum, shooting gallery, and most interestingly, the Goldfield Mine Tour. That comes complete with floor shaking "dynamite explosion" and elevator ride. 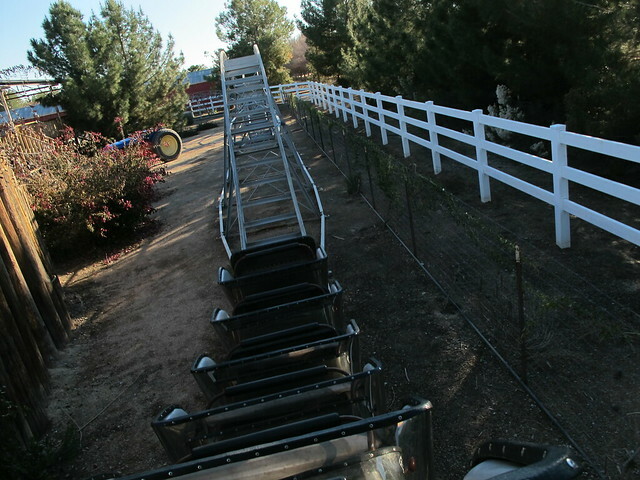 -Rawhide Steakhouse and Theme Park closer to Phoenix is exactly what it says it is. Plenty of trailered vehicles shaped in various fashions, shootouts 3 times a day, and steak. 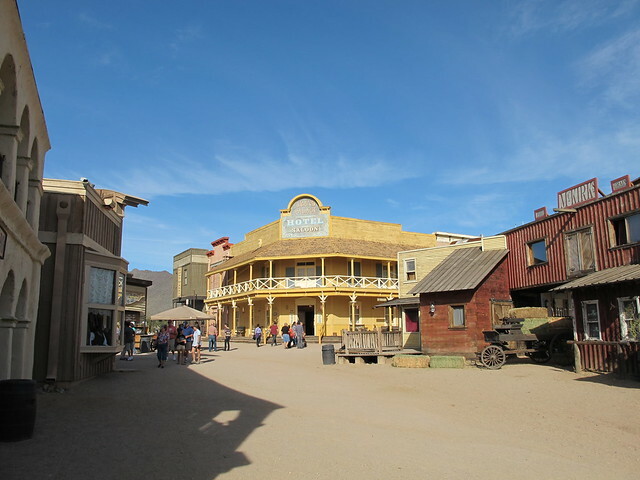 -Trail Dust Town in Tucson, AZ also features a steakhouse and stunt show/shootouts. 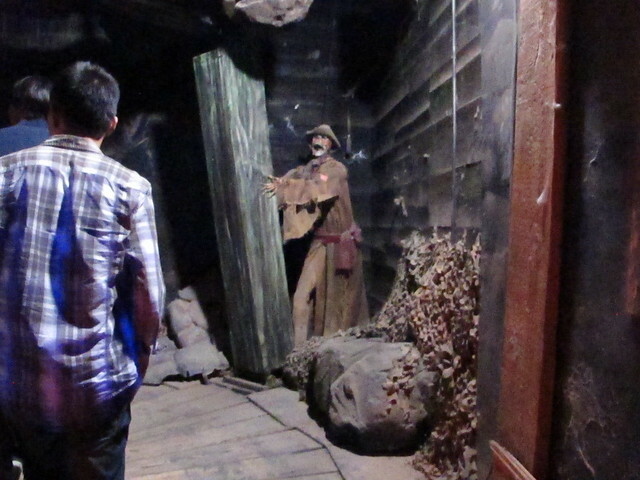 But there's some actual mechanical rides like a ferris wheel, Herschell Carousel, and most notably, a Chance CP Huntington train with a dark ride-esque segment through the "Ol' Terrible Mine." 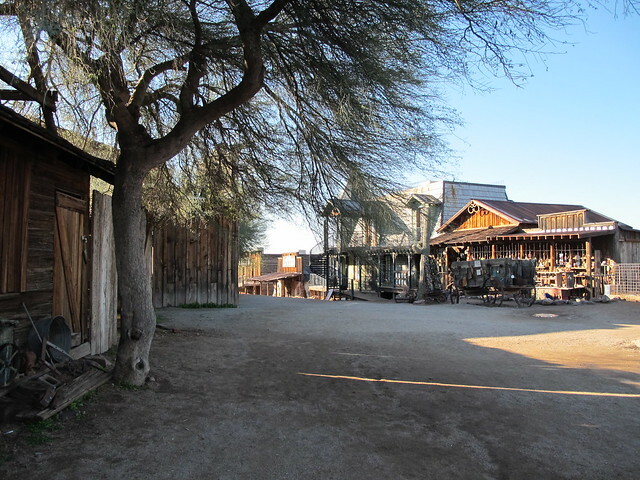 -At the far end of the spectrum is Arizona's studio park, Old Tucson Studios. There's another carousel and Chance CP Huntington train here, but there's two items that are a little more unique in this space. One is an antique car ride, which is about average for the style. The second is the Iron Door Mine Adventure. Noted on the Dark Ride & Funhouse Enthusiasts site as a dark ride, the cars were removed at some point in the past, and it now acts as a guided walk-through attraction.